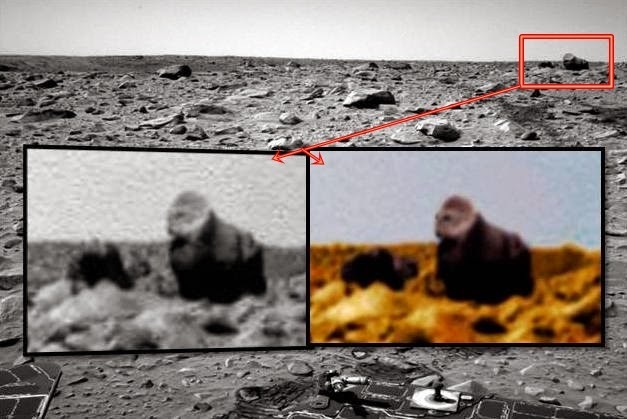 Hybrid Hominoid caught by Mars Rover Spirit proves that NASA manipulates photos? Original NASA picture can be found on their site here. The image, which was taken near the Gusev crater, appears to show a gorilla or bear type creature. This object was discovered a few years ago but Paranormal Crucible worked on the image and brought out more details. It is well known NASA cover-up photos and personally I think NASA's artist had a creative day and has been airbrushing out an anomalous object. In 2013, Donna Hare a former NASA employee while working for NASA contractor, Philco Ford came forward and testified that she was shown a photo of a picture with a distinct UFO. Her colleague explained that it was his job to airbrush such evidence of UFOs out of photographs before they were released to the public.